This Veterans Day, Brevard College will honor our nation’s retired soldiers alongside one of its own retired faculty during the Music Department’s annual Wind Ensemble Concert. 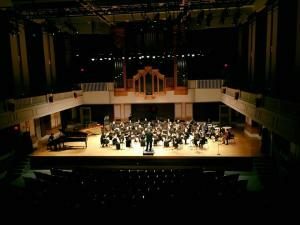 The concert is slated a few days after the federal holiday, on Tuesday, Nov. 15, at 7:30 p.m. in The Porter Center for Performing Arts’ Scott Concert Hall. The show is free and open to the public. The first half of the concert will highlight retired faculty member Dr. Larry Whatley’s illustrious 37-year career teaching Music Theory at the College. Whatley’s courses focused on harmony, form and analysis, counterpoint and orchestration. He is an active composer who has written chamber music and music for band, orchestra and chorus, including commissioned works and published works. Whatley retired in 2000 as the Iva Buch Seese Distinguished Service Professor of Music Theory, Emeritus. The program will feature a wide variety of concert band repertoire, including “Army of the Nile” by Kenneth Alford, “Khan” by Julie Giroux – an exciting programmatic work depicting the ruthless Genghis Khan and his marauding army – and “Guarded Well By Mountains – A Hymn for Brevard College” composed by Whatley. This will be the first performance of Whatley’s arrangement of the Brevard College Alma Mater for concert and band choir. The Brevard College Concert Choir will be featured as guest performers.